You’ve probably heard this before, Joel Osteen says it every week. He got it from his dad. The incorruptible, indestructible, Ever-living seed of the Word of God. I will never be the same . My Pastor has done this a few times and I find it effective as far as it increases faith and you hear yourself declaring dedication to the scriptures. I was listening to a podcast this morning with Cameron Cole and the conversation inspired me to come up wth my own declaration. I am still tweaking it but you are welcome to steal it or offer suggestions. It’s easy to make something like this too long but I thing I have the right length. It reveals who God is. and that I am saved by grace through faith and not by performance. It shows me the way to live and the way to love. and I have power, though the Holy Spirit, to follow Jesus every day. I came up with this because I’ll be teaching a series soon on the Bible and why we need it. 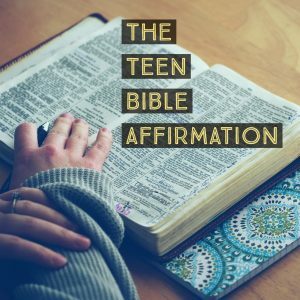 Do you have a Bible affirmation for teens? If not, do they need one? Why or why not?